The first time we saw the new version of DC’s outer space super-team, they were broadcasting what appeared to be the live murder of someone who used to be a Green Lantern. One of the Omega Men slit Kyle Rayner’s throat as millions of sentient beings watched. Believe it or not, the Omega Men are supposed to be the good guys. 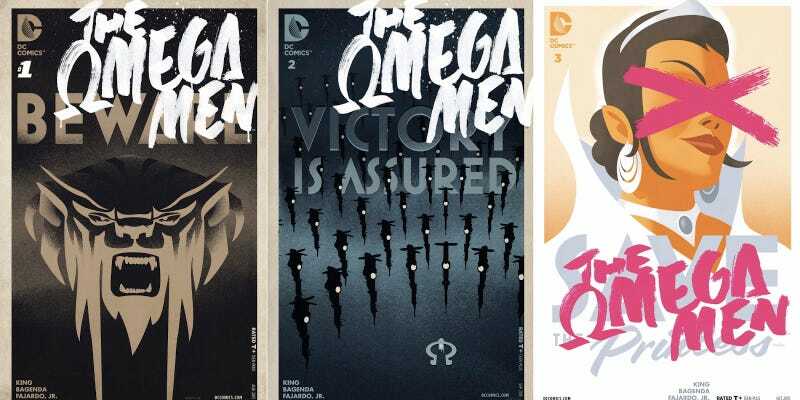 Omega Men is a new series that’s part of a reinvigorated publishing line launched by DC in June. It revives an old 1980s sci-fi concept where a polyglot rebel movement of characters from different extraterrestrial races fought against an evil galactic empire. But, as the broadcasted death of Rayner shows, the new Omega Men—written by Tom King, with art by Barnaby Bagenda, Jose Marzan Jr. and Romulo Fajardo, Jr.—is much darker than its predecessor. The team are now presented as freedom fighters or, with the most thinly veiled references, as terrorists. They are at odds with a malevolent interplanetary empire either called The Citadel or the Alpha. The use of Rayner as a symbol is important in Omega Men. For a time, he was the only active Green Lantern in the mainline DC universe, the torchbearer for a centuries-old intergalactic peacekeeping corps. He then went on to become the sole White Lantern, a being capable of godlike feats of healing. Kyle’s powerless in Omega Men unable to use any of his former abilities to make things better. Inside the series’ fiction, a high-profile death like his is a political incident that could ripple throughout the galaxy. It soon becomes clear that Kyle Rayner’s fate is worse than death. He’s still alive but being forced to work with people who say they’re fighting for justice but have no regard for his moral code. The disgusting calculus that undergirds all armed political conflict is laid bare in Omega Men #2. The Alpha empire’s rulers are furious about the Omega Men’s actions and demand public executions on one of their member planets as restitution for a security lapse. The Alpha regime essentially says that the their soldiers’ bodies are worth more than others.The negotiation between the Citadel functionary and a local governor is chilling. The evil of the Citadel seems intended to make us sympathize with the Omega Men or to at least see them as the lesser of two evils. It’s still a strange situation, since the creative team has both invoked comparisons of the Omega Men to the real-world monstrosities of ISIS and has had them slitting the throat of a bona fide Green Lantern super-hero. Rayner is forced to join the team on their journey and various members tell him that he’s one them now. His indentured servitude to the Omega Men illustrates just how different this team is from the Green Lantern Corps or Justice League. That point gets driven home when Omega leader Primus lies to Kyle, letting innocents die in those public executions so the team could steal a Citadel ship. So far, Omega Men has spooled out a constant compromise of principles that makes it hard to track the actual heroism being done. King has Primus and other Omega members show lots of remorse when he has these characters kill to achieve their goals. Barnaby Bagenda’s pencils capture the anguish on the major players’ faces as they slide down a slippery slope, as well as the absurd dark-comedy of manners that happens during this kind of total oppression. but rages at how her people have lost their autonomy. The paradox is sharp and cuts even deeper with the issue’s surprise ending. While Omega Men does have its share of fistfights, its most fascinating action is the brewing war of ideologies. The resemblance to the kinds of political public killings performed by ISIS and other terrorist organizations—faked by the Omega Men, and done for real by the Alpha Empire—is probably not an accident. Before he wrote comics, King worked at the CIA as an operation officer in the Counterterrorism Center. He knows what asymmetrical warfare looks like and the bodycount of innocent lives that get taken by the armed forces there to “liberate” and “stabilize” the areas where they operate. It’s a tricky gambit to invoke the optics used by bad actors on the political stage, but King nails it. The evil we see in Omega Men isn’t being done by hand-rubbing, mustache-twirling supervillains. It’s perpetrated by a global power that looks a lot like King’s former governmental employer. DC Comics had made big changes to some of its characters in the last few months, including a Superman who’s weaker and a Batman who operates a mech suit. Omega Men represents a different kind of change. It’s a discomfiting nod at the world we live in, where good things get done in bad ways and where somehow we have to live with ourselves as time moves on.